Organic | Our Farm by Earth Flora Inc.
We’re running short of rice. But our country also has an alternative grain. This is the tropical and indigenous ADLAI. It is also called “Job’s Tears.” It’s a versatile grain. Our ancestors cultivated this ancient grain as a staple. The aborigines of Mindanao, considered as the first inhabitants of Pagadian City in Zamboanga del Sur, have been growing adlai as staple food in the highlands, the same way those in the lowland eat rice. The use of adlai as a staple though has diminished over time. Adlai grows like grass. You can plant it anywhere and it thrives well despite a harsh climate. After harvesting, Adlai continues to bear grains. When you cut its stalk, a panicle appears again. It is also tolerant to pests and diseases. Farmers can harvest 5 to 6 times a year! Adlai has been included in DA’s food-security blueprint. It is also part of the Slow Food International Ark of Taste. The grits can also be ground into flour. It can also be made into crackers, rice cake and cookies. It also has 3x more calories and 6x more protein than rice and is regarded as a cure for diabetes. We should learn to eat this indigenous grain like we eat rice. We grow two varieties: halayhay and Nomiarc dwarf. We’re saving the seeds of this indigenous cereal and growing more in our farm. There could be enough seeds for everyone. Not only is it a food staple, but we use it as a windbreak and fence, in companion cropping, and especially as part of our ecological pest control. 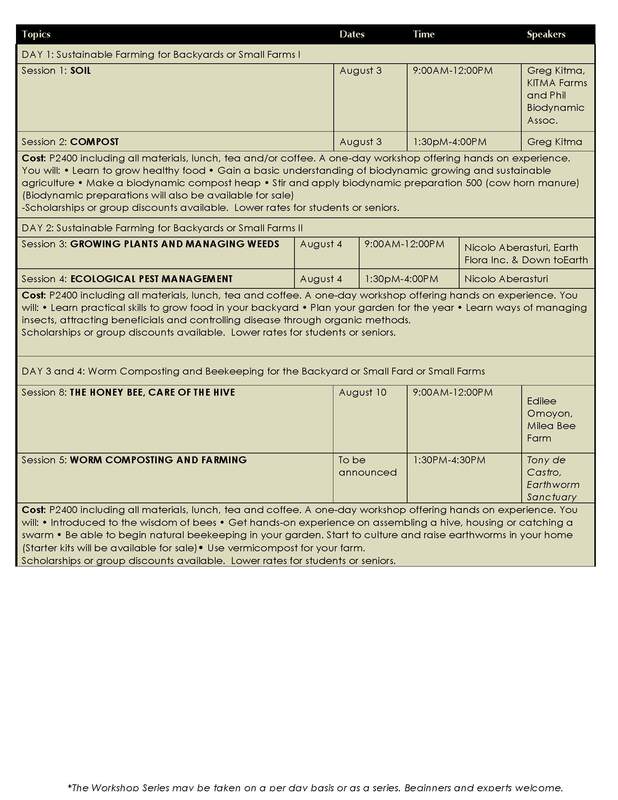 This workshop is especially for those interested in starting their own backyard garden, urban kitchen garden or small farm while practicing sustainable, holistic and biodynamic methods. We are combining the wisdom and hands-on expertise of real farmers. For would-be and aspiring farmers, this is a rare and powerful learning opportunity. Gain a basic understanding of biodynamic growing, permaculture, agro-forestry and sustainable agriculture practices. 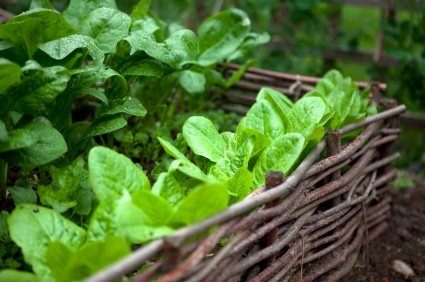 In particular, we introduce a method of transforming your backyard into a food forest. DATE AND TIME: The Introductory Backyard Farming Workshop will be held on January 28 Saturday. The Workshop starts at 9AM with a short break in the morning. Lunch is from 12:30-1:30. It ends at 4:30- 5:00. Some practical work is included. 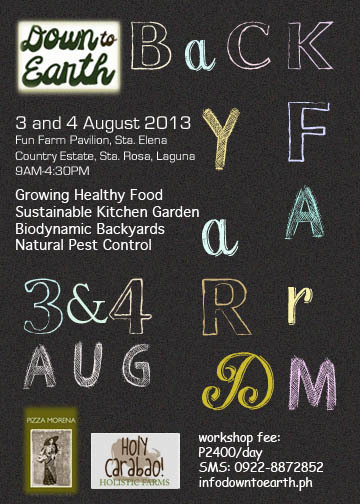 We will discuss building soil and composting, growing your garden and pest control. You will also see our homestead and how we grow our garden at home. The workshop will be held at Clubhouse of Hacienda Sta. Elena, Barrio Malitlit, Sta. Rosa, Laguna. EXIT ETON: Turn left on Sta. Rosa-Tagaytay Road (you will see Paseo de Sta. Rosa on your left.) Go straight until you see Vista Mall on your right. On your left will be a sign “Sta Elena City.” Make a left into Sta. Elena City (it is before Nuvali). You will pass Fontamara homes, Mesa Homes, Augusta, then you will reach Georgia Club Rotonda. Make right at the Rotonda. It is a long road. You will see walled communities such as Belle Reve on the right. At the end of the road is another Rotonda, make a left. Follow the long road until you see the Hacienda Sta. Elena gate. Enter the gate and ask for directions to the Clubhouse. Group Discounts are also available. Scholarships are available. To ensure your place, please send full payment by January 18, 2017. You can pay via bank deposit or personally at our shop (Makati Curb Holdings, #7433 Ground Floor, Unit J, Yakal St., San Antonio Village, Makati City. Alternatively, you can pay us at our DowntoEarth booth in the Salcedo or Legaspi markets on Saturday or Sunday. If for some reason you cannot make it to the workshop, a fee of P500 will be charged to cover administration costs up to two weeks prior to the commencement of the workshop and the balance will be refunded to you. Within 2 weeks of the workshop commencing however, a 50% cancellation fee will be charged. If for some reason the workshop is cancelled, you will receive at least 2 weeks notice and your full payment will be refunded. If you have other questions, please let us know or SMS 0915-8979044. We have been harvesting tomatoes, peppers and eggplant from our front yard. We grow these crops in raised beds. 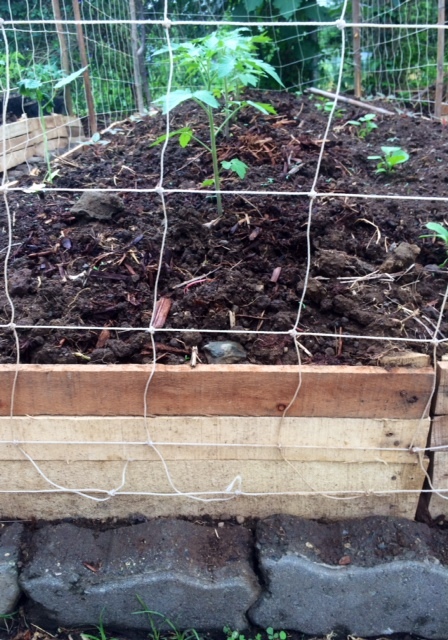 If you have a some soil where you live, the best way to grow food is to plant using a raised bed. How do you make a raised bed? 1. Find the space for it. You should have plenty of soil and sunlight (6 hours of sun.) It should be narrow enough so you can reach all of it from all sides. If you have enough space, you can have multiple beds. If you do, leave some room in between for a pathway. 2. The height of your bed should be from 1 to 2 feet. We use 4×8 rectangles. 3. Use anything for the walls that will stand up to water. We use pallets. These are discarded tomato crates, which we have in abundance. You can use slates, scrap wood, or sustainably harvested wood. Now build a box. 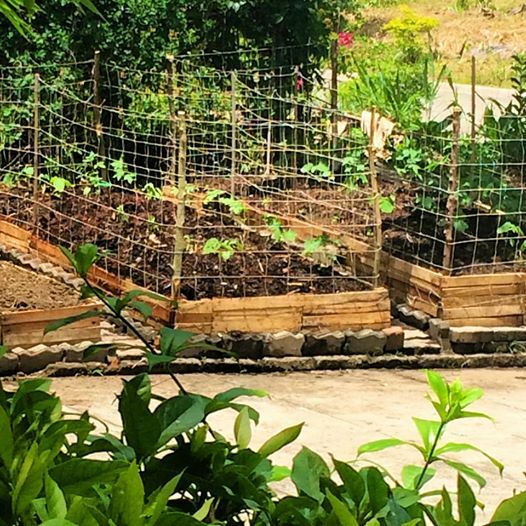 Any kind of construction of a walled enclosure will suit your purpose for a vegetable bed. The box will have four posts for the corners and you affix the wooden boards to the post. 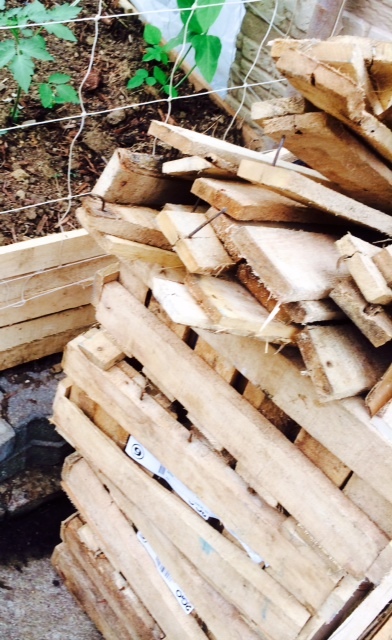 If you are building using pallets, break the pallets and reassemble them with 4 planks side by side. Affix the 4 planks to make the sides of your bed. You do this by placing 4 planks side by side and then using another plank as a base at the back. We used No. 2 nails to nail the plank to the base. Leave an inch or so of the base board protruding so you can use this to bury the assembled planks (fence) to the soil. We kept the fence steady by burying it a little deep and by supporting it with a cement brick on the outer side. 1 pc. 4”x4”, six feet long. Cut into 4 equal parts. 4. Make sure to poke or break the soil where your bed goes a little. 5. Fill the bed with good soil. We combine the soil from our with biodynamic compost we have saved. If you do not have your own compost, buy the best soil you can afford. It is crucial that your beds have good soil. This will determine the health of everything you will grow in it. Fill the bed all the way up to the top. 4. We cover our beds with aviary netting to keep out our native hens and dogs. We just used long sticks on four corners of the bed to hold the netting in place. 5. You are then ready to plant. We start our seeds indoors in a nursery until they sprout. We then keep them in the nursery until the true leaves appear and are looking sturdy. She might be right. Whether it be war or a disaster, seeds may be more valuable than guns and bullets. You can feed your family with seeds you have sown, or with a small patch of vegetables nearby. I still remember the last calamity. Entire communities were going hungry, cut off from the rest of the world. What if they had a homestead, or a community garden nearby? We ought to start saving seeds. Call it survival packets. Seed saving is an age-old practice. Traditionally, farmers would select the most robust and disease-resistant plants and then save the seeds during a season. With the advent of hybrid seeds however, farmers have stopped the practice of saving their own seeds. This is because seeds harvested from hybrid plants produce seedlings that are unlike and inferior to the parent seed. Also, most of the seeds you purchase are treated with fungicides. Our small farm has started a seed bank. (Biodynamic practices require the use of untreated seed. One way to ensure that seeds are not treated is by saving the seeds yourself.) We bank on heirloom seeds that are open pollinated. These are seeds that have been handed down and successfully cultivated for generations. A vegetable variety can be considered an heirloom once it has been cultivated for over fifty years. Heirlooms have a different flavor. We have heirloom seeds for tomatoes, eggplant, and some varieties of corn. We even have seeds for purple corn, a locally adapted variety that we got from individual farmers. 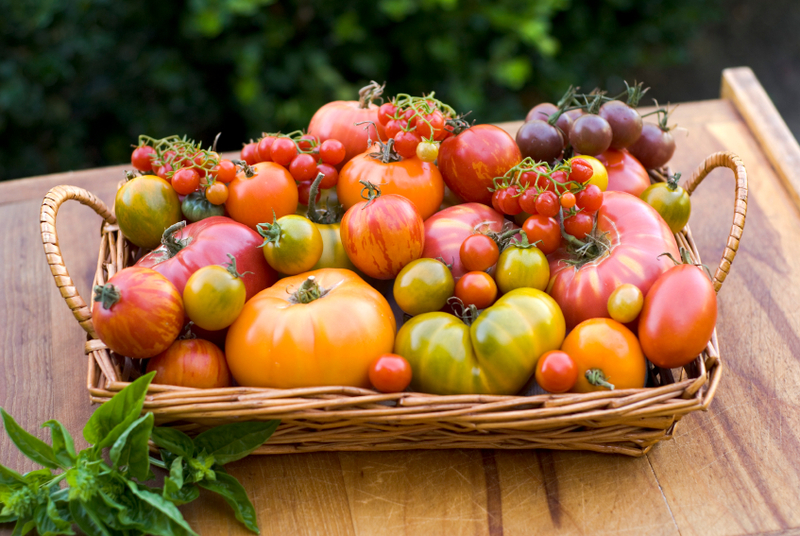 Heirloom seeds reward us with better tasting produce. 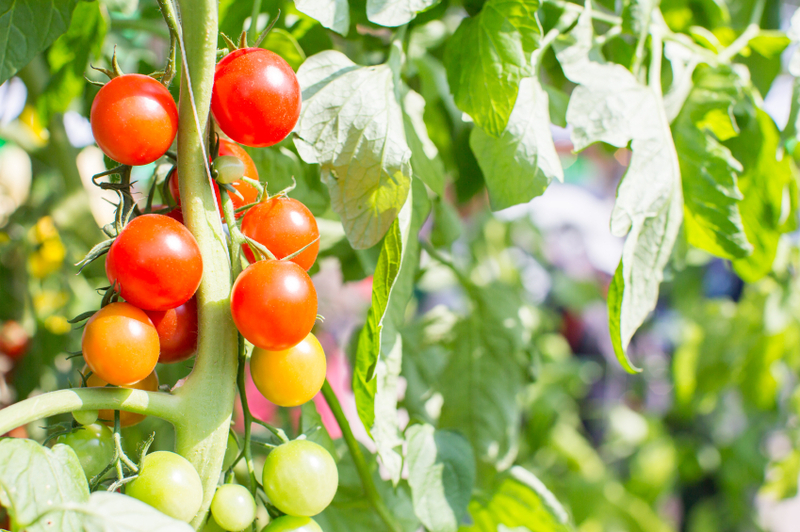 Unlike the hybrid varieties, heirlooms can be saved and replanted every year. (Hybrid varieties require planting new seeds every year.) Additionally, heirloom seeds adapt to the location over time and what you have are resilient seeds that will grow abundantly where you are. They are more resistant to disease or to harsh weather. We’re looking to save more and more varieties of heirloom vegetables, flowers and herbs. We’re trying to find and collect heirloom varieties and then grow these on site. And then we collect seeds when they are fully ripe and dry. Easy seeds to collect are from tomatoes and beans. As our climate becomes more erratic, seeds that have been passed down, adapted to our soil, and grown resilient over time, will thrive and produce better crops. Saving seeds gives us the means to grow our own food. It is the key to food sovereignty because you know how to get food and exactly where it comes from. A huge chunk of the seed market is already controlled by big companies like Monsanto and Bayer. These seeds are treated with pesticides, herbicides or are even genetically-modified. If you are able to save your own heirloom, local, open pollinated variety seeds, you are able to replant and regrow them every year, without being dependent on the big companies that patent and control hybrid varieties. What happens now, when farmers have lost the rhythm of the seasons? When there is no longer a time for everything: to plant; and to pluck what has been planted? And what happens when farmers give up on the land? Every year for the last 20 years, we had sown seeds on December and then harvested a predictable volume on February. It was perfectly orchestrated. The plants would shoot up, bud, and then burst forth in blossom for Valentine’s Day. There was a season for everything: a time to plant; a time to pluck up what is planted. Perhaps it is none of your affair. The poor vulnerable farmer, at the mercy of an extremely erratic Mother Nature. Who cares? You can enjoy the unusual cold with a cup of cocoa, or the hot day with a summer salad. Except. It is this poor vulnerable farmer who actually supplies you the cacao that makes you hot chocolate. It is the poor vulnerable farmer who tends to the lettuces and carrots that make your salad. And when your farmer is not secure, the food on your table is not secure either. You can only reap what they sow. Far removed from the seed, the sprout, the produce that magically settles on our plate, we take farming for granted. We cannot appreciate the daily grind of the farmer who works the land. We cannot grasp the medley of earth, nature, seasons and the farmer that bestows us fruit, flower, vegetable and grain. And because we can buy the fruit, the salad, and the rice at ease, in nice packages at the supermarket, we forget that it takes at least three months of industry to get anything from seed to plant. This is the 6th of a Series on Backyard Farming. This article deals with natural methods for pest and disease management and control. We practice ecological pest management in the farm. This means that you manage the ecology of your farm and not just get rid of pests by toxic pesticides. Build a strong ecosystem with healthy soil, mulch and organic fertilizer. Your first line of defense is a healthy soil. Your plants will be healthy if your soil is healthy. Healthy plants will be able to resist insect and disease attack. Mulching is a good way to control pests. The mulch will house beneficial insects and earthworms. Crop rotation will keep your soils healthy too. Make sure that plants and not planted on the same spot every time. 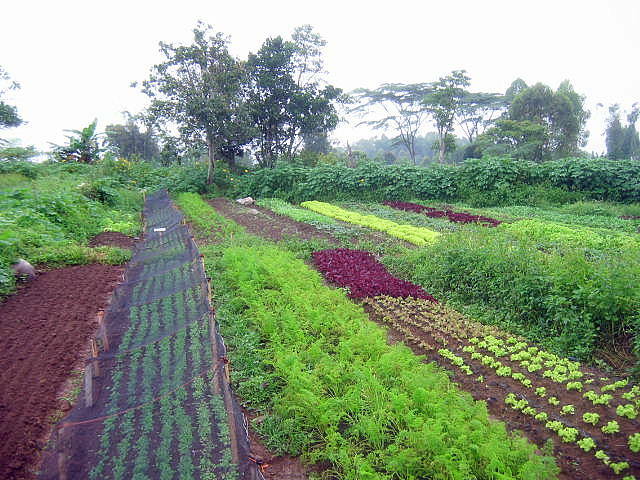 Multiple cropping or companion planting also helps rid you of pests and diseases. These too methods will provide a continuous source of food and encourage beneficials insects to remain in your bed. See article on Crop Rotation and Multiple Cropping. We practice cover cropping in our farm. The legumes boost our soil’s nutrient content, build more organic matter in the soil, and prevents erosion. Make sure you have plenty of earthworms too! The kind of plants you have will be crucial for pest/disease management and control. Make sure you plant varieties that are resistant to the diseases that are common where you are. Also, plant the kind of plants that thrive well given your topography and weather conditions. 1. For temperate crops, keep the leaves dry. This is because insects and fungus thrive on wet leaves. Wet leaves also spread disease. 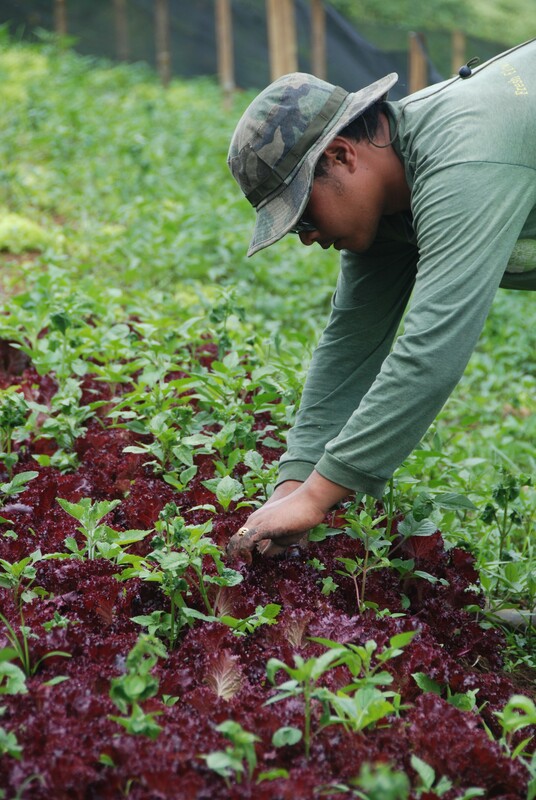 In the farm, we use drip irrigation to make sure that our leaves are dry and there is not too much water. 2. Your best control is BIOLOGICAL control. This means you need to understand the life cycle of insects or pests so you can control them. Also, the more variety of insects and animals you have in farm, the better your Biological Control. 3. We rely a lot on Beneficial Insects. 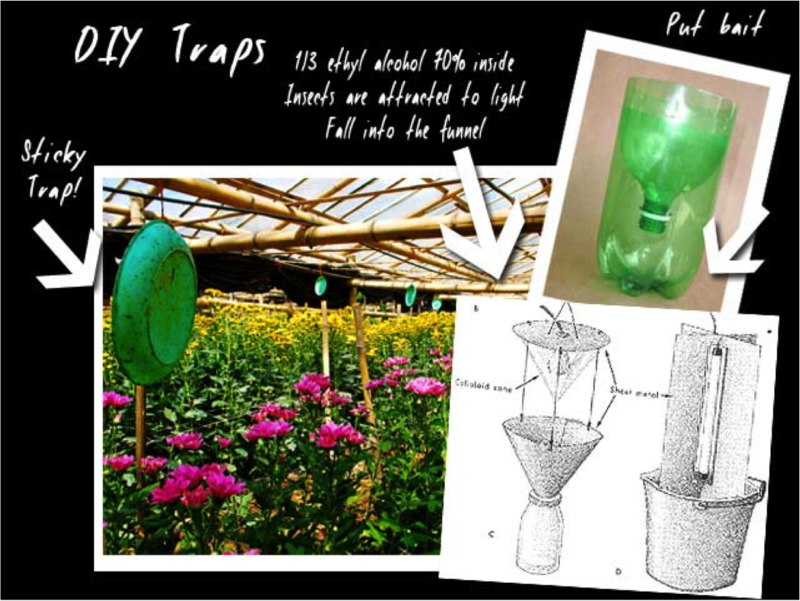 These are using insects, microbes, or bacteria to control pests and disease. They keep the population of damaging insects under control. Unlike pesticides, they only kill the BAD guys. IN our farm, we use ladybugs, lace wings or stingless wasps that feed on pests. For example, ladybugs are able to eat up to 1000 aphids a day. Lace wings eat more than 200 pest eggs a week. Wasps (Trichogramma) are able to control up to 28 species of insects. 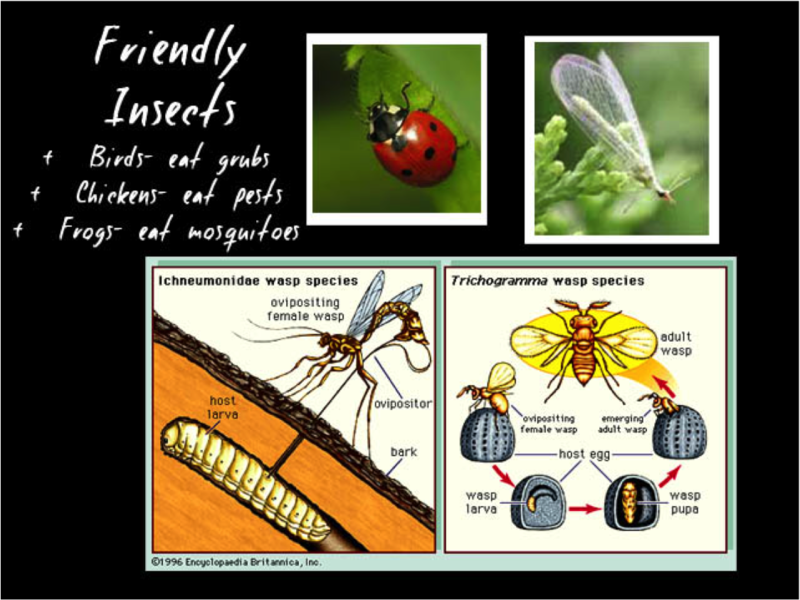 You can read more about nurturing and making use of Beneficial Insects here. Do-it-yourself Sticky Traps: Hanging sticky traps in trees or posts can help capture a lot of flying insects. Neem Citronella: Neem does not immediately kill the insect. Instead, it alters an insect’s behavior or life. Eventually the insect can no longer feed or breed or metamorphose, and cannot cause damage. Fish Emulsion (Fish Amino Acid/Foliar): More than a pesticide, it doubles as a great fertilizer. Fish emulsions are wonderful sources of nutrients. Read about Fish Emulsion here. Worms and Caterpillars: They eat the larvae of plants and eradicate seedlings. Effective controls are beneficial insects, multiple cropping and crop rotation. Leaf Miner- You can prevent Leaf Miner if you spray Fermented Fish waste and Milk. You can also use sticky traps. Crop rotation is recommended for prevention. Flea Beetle–These insects attack during summer months and usually Asian vegetables. They like dry environments. Control these pests by wetting beds and mulching. White Fly- You can use a spreader sticker (sticky traps) or coconut-oil based soap spray to control White Fly. Diamond Back Moth–These moths will attack cauliflower, broccoli and cabbage. To prevent outbreak, control the moth that lays the eggs through light traps, ordinary mosquito traps or have sacrificial beds. *Always remember to prune or remove diseased plants. Mildew is a fungal disease and includes white patches on leaves, discolored or yellow leaves and wilting. Remove the infected areas and dispose it. Do not add to your compost pile. -Powdery Mildew- During dry season, you may experience powdery mildew. To control or prevent this, keep leaves wet. You can also use milk spray or neem oil. -Downy Mildew- During wet season, you may experience downy mildew. Don’t wet leaves at night. You can also use milk spray or neem oil for prevention. Blight– This is bacterial damage that causes rotting stems and roots, black or brown spots and lesions. Trichoderma can suppress blight. Once you have it, make sure to remove the plant and dispose. Do not put in your compost pile. To avoid the disease, practice crop rotation and plant resistant varieties. Good luck! You will be able to manage pests and diseases with a combination of: (1) Strong Ecosystem; (2) Attentiveness; and (3) Good use of organic controls. Our Farm by Earth Flora Inc.